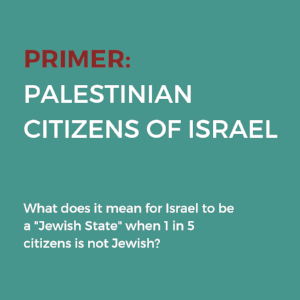 Adalah Justice Project focuses its work on Palestinian citizens of Israel to advocate for the rights of all Palestinians. Understanding Israel’s treatment of its Palestinian citizens, who make up 20% of the country’s population, and its unwillingness to protect equal rights for all, clarifies the root of injustice: an exclusionary state that privileges the rights of certain people solely on the basis of who they are. We believe that any political solution must answer for the historical and ongoing injustices of the Nakba, and create a reality where the human rights of all people are protected in Palestine/Israel. The film “Targeted Citizen” (15 minutes) surveys discrimination against the Palestinian citizens of Israel. Learn more in Adalah’s Inequality Report.